Fun is relative when in Boracay Island. The mood of stay is set by the accommodation one has while in the island. For the many times I’ve been to the island, I have always booked my accommodations at the beach front, where fire dancers make their presence as the center of attention during night, where friends and families converge to dine near the shores, where party goers do the merry making and drinking spree for as long as they can withstand and where commerce is heightened even at the wee hours of the morning. And every morning back then, I was always nursing a hangover. This time is quite different. At this recent visit, I was relatively a few blocks away from the sounds and the party scene of Boracay Island, in my new home, the 5-month old The Ferra Hotel Boracay. A different perspective but of the same fun and contentment summarizes my stay in the island while taken cared of at the Ferra Hotel. As soon as we entered the Superior Room, the modern-minimalist design is a striking scene. It truly feels like a new apartment that had there been no time and budget constraints, I can stay here for more than a month. Key amenities are at our fingertips. The room is equipped with a free wi-fi internet access, cable TV, DVD player, individually controlled air-conditioning unit, hot and cold shower, mini-refrigerator, coffee and tea maker and in-room safe. The room is good for two but it is so spacious that you can throw a party at the room. The room provides a soothing ambiance and a really comfortable and good night sleep. For most of the times, we were just confined at the comforts of our room and stroll at the beach late in the afternoon. There is a mini-living room as well adjacent to a kitchen where sofa is so conducive for sleeping. There are two television sets – one in the living room and another in the bedroom. The ground floor of the hotel houses its in-house restaurant, Modern Asia. Earth colors abound as interior design in shades of blue and green prominently. Our breakfast buffet was served at the restaurant where choices though may be quite limited is sufficient enough as a good start for the day. As the name of the restaurant suggests, Asian cuisine is offered on local favorites with a twist though continental cuisine is also available. Right beside the restaurant is a swimming pool. And of course, our stay won’t be complete without a plunge at the well-designed pool. It feels a bit awkward that while swimming others are dining at the restaurant. And so we decided to get back to our room and went down to the pool just before lunch time as our instant itinerary. Everyday, it has always been our aim to witness sunset at the roof deck and have cocktails in the sofa loungers (for a change). But to no avail. Until one night, General Manager of the hotel, Mr. Dante Cruz, invited us over for dinner to sample their delectable and gastronomically appealing cuisine offered at the Ruf Bar. Cocktails were also served and after a few hours, we succumb to the comforts of our bed and slept early as I need to catch my morning flight. We were joined by the lovely ladies of the Marketing Department of the hotel, who became our friends as well. It was a good night that I had hesitations of going back to Manila but I have to fulfill my corporate duties. If there is one factor that makes Ferra Hotel a standout, it is the efficient hospitality service that they provide. Everyone who works at the hotel were indeed friendly and accommodating. The homey vibe is something that cannot be discounted. As the hotel also offers guided tours within the island and engagement of water sports activities, the rates are quite competitive as compared with the neighboring travel agencies. And if you don’t want to avail, still the receptionists will provide clear instructions and options on what to do while at the island. 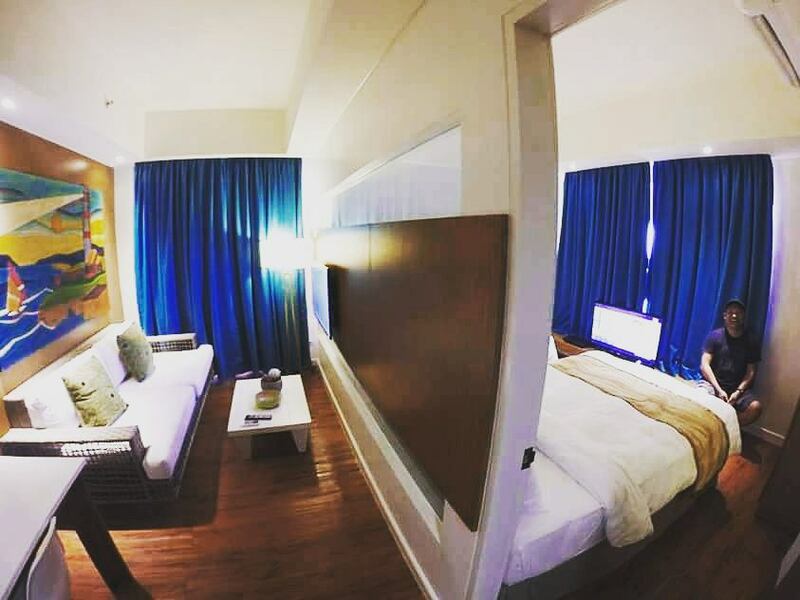 The stay at Ferra Hotel is one of the best stress-free stays in Boracay Island with friends. Except for last year, I always visit the island at least four times in a year and this recent visit provides a different perspective. Though my first visit this year was with my parents and siblings and with the short stint I did enjoy the weekend vacation, traveling with friends is a different scenario and I’m glad I opted for the more quiet stay in the island. Staying at Boracay Island, days before my birthday, the experience at Ferra Hotel is one for the books. Truly, rejuvenating and relaxing with a good location, leaving the guests an option of what to engage while in the island.